CareConnections will provide several new enhancements beginning September 8, 2015, which include simplified assessment queue process, FABQ available on all assessments, and the ability to delete registrations. 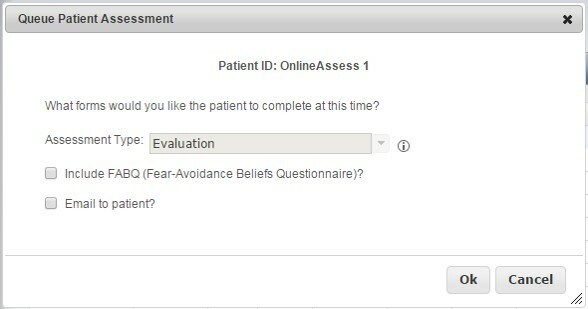 Why Allow Patients to Select Problem Area? Why does it make clinical sense to allow the patient to select the problem area? In the ideal workflow, patients should complete CareConnections Outcomes prior to their first appointment. This allows the PT to have a completed form at the beginning of the evaluation for use in goal setting. The easiest workflow to accomplish this is to have the patient complete an assessment via the Kiosk Application, preferably at home via email, but it can also be done in the clinic. 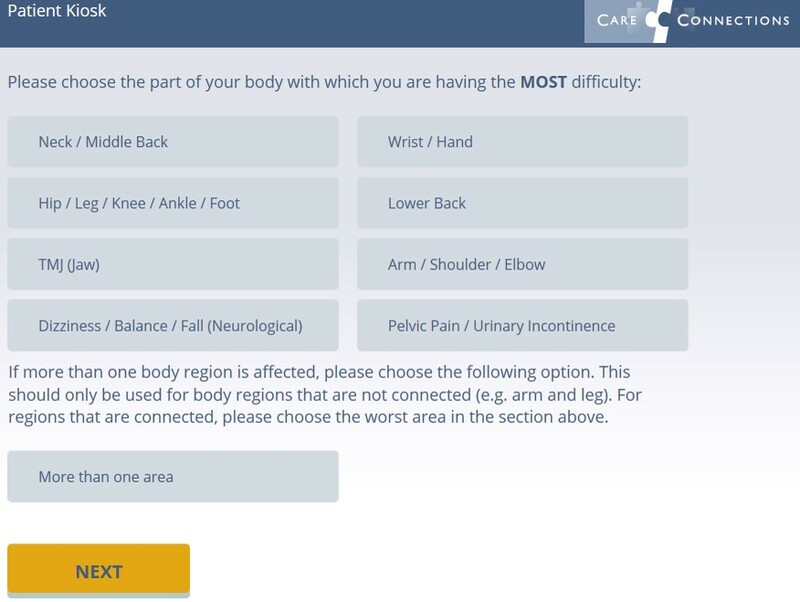 The new workflow allows a patient to self-select a body region and does not rely on the clinic office staff to enter this for them ahead of time. What if patient chooses the wrong area (e.g. chooses Upper Extremity when it is really a Cervical/Thoracic Issue)? The kiosk application asks a few additional questions regarding adjacent problem areas (e.g. Upper Extremity and Cervical/Thoracic). If a PT determines the wrong area was scored, the office staff can simply open the registration and change the Anatomic Group (Diagnosis phase) and Problem Area (Intake phase), and function will automatically be re-scored using the additional questions. If the wrong problem area was selected from a non-adjacent body region, the assessment can be re-queued for completion by selecting "Re-administer Intake" and allowing patient to select a different body region. Does this affect non-Kiosk surveys? No, this functionality only affects kiosk surveys. NOTE: Clinics should never use the Patient Kiosk App to enter results collected on paper forms. Results collected on paper should be entered through the standard registration process. Why the switch in functionality, and why all of the focus on Kiosk? NOTE: FABQ is an optional form that you are not required to use. Deleted registrations are PERMANENTLY deleted and cannot be recovered! What kind of registrations should I delete? What kind of registrations should I NOT delete? Any registration where outcomes are collected on evaluation visit and the patient is seen for at least one visit, should not be deleted. Even if a patient drops out of treatment early, this kind of case can be completed as a self-discharge and will be accounted for on your Self-Discharge report at the end of each quarter.